Hello people! Once again a great contest! Any comments are more than welcome! 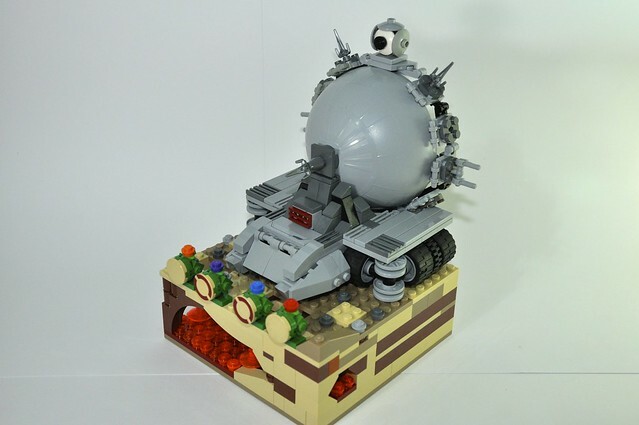 Thanks again for this contest, I had some fun building the vignette. 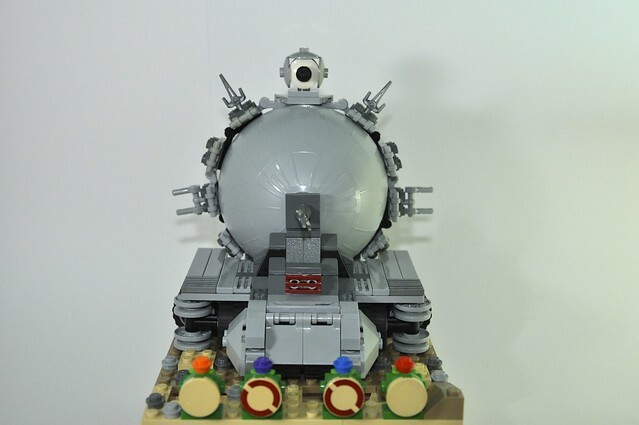 The turtles face to face with the Technodrome in the Earth's core, so ive added some magma flowing beneath it. Last edited by Midi on Sat Mar 30, 2013 11:24 pm, edited 1 time in total. Hello all! This is my contest entry. 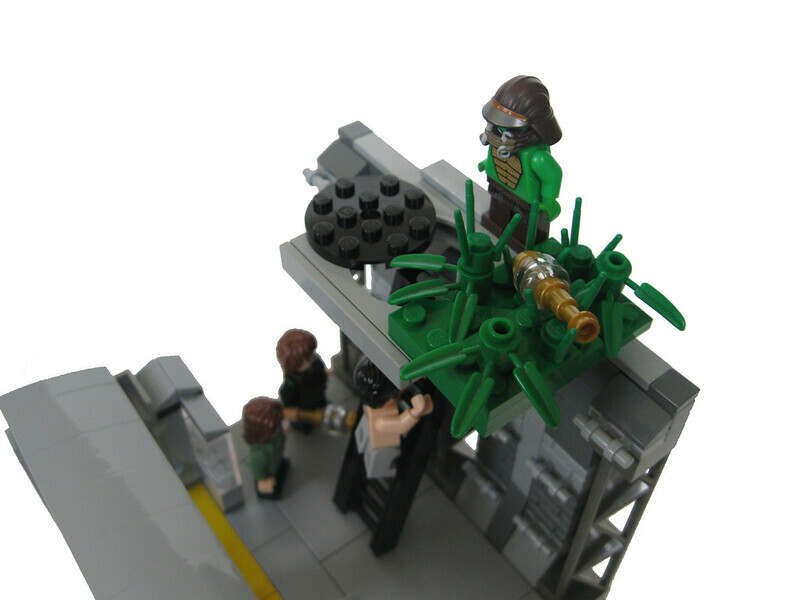 It is inspired by Teenage Mutant Ninja Turtles III (1993). It is a loose adaptation. 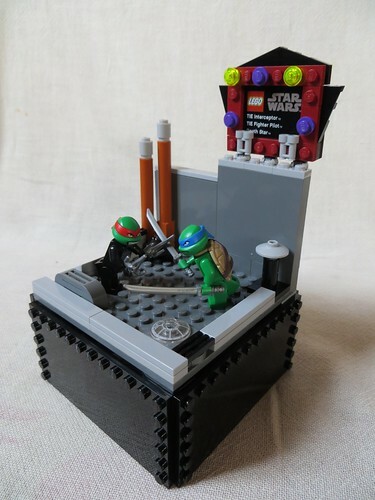 My entry into the FBTB TMNT vignette contest. 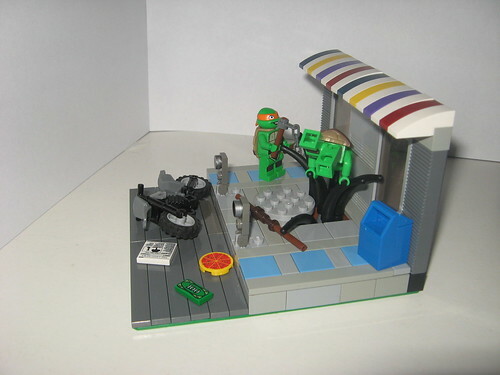 It is inspired by Teenage Mutant Ninja Turtles III (1993). I chose to use that movie as my inspiration because I have fond memories of watching it as a child. 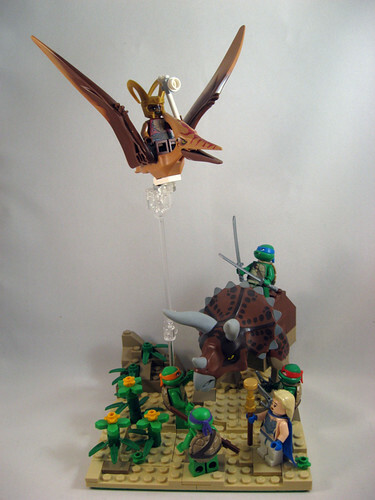 This vignette depicts the scene in which the turtles come forward in time to return home. More specifically, it is the part where Mikey must return by unspecified other means after missing the return window. 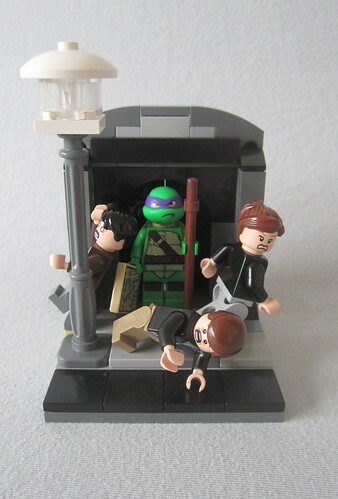 I included the scepter in old Japan, where Mikey is, and one in April's hands. 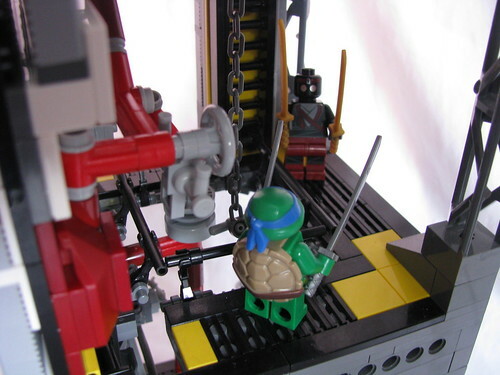 The room itself is a combination of two rooms within the turtles' abandoned subway base from TMNT III. 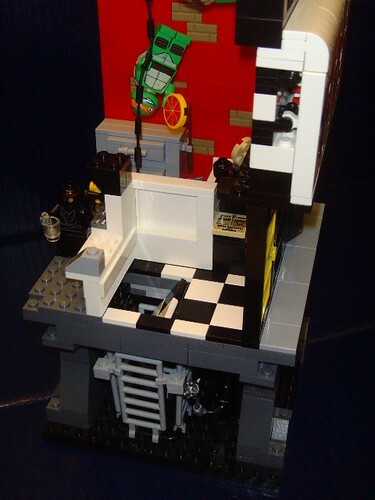 The room 1 modeled it after is the subway platform which contains Master Splinter's subway car-home. There are also, in the film, sewers which connect to the subway station. I couldn't tell you why if I wanted to. Anyhow, one of those sewer areas is circular with a ladder leading up to a manhole cover. I just put the ladder and manhole cover on the subway platform. Splinter is standing in the subway car, if you missed it. New Yorkers/Bostoners/Anywhere-else-with-a-subway-system-ers: note the subway-accurate yellow strip at the edge of the platform. I would have used a plate but that would have restricted the doors on the subway cars. Also, the manhole cover appearing in the grassy field in Japan is my interpretation of what it looked like: Mikey doesn't actually see that in the movie. EDIT: Just realized I forgot to compliment everyone who's entered so far! So many great entries. My personal favorite is the "Without Honor." A humongous thanks to FBTB for this great contest! Here's my submission. I hope it conforms to the rules. 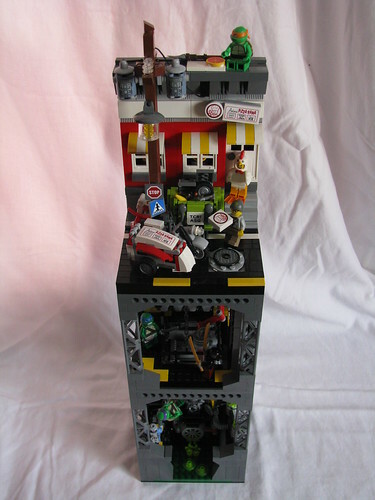 The base is approximately 12 by 15 studs wide with some overhang. You do realize that it's allowed to be up to 16x16, right? It doesn't have to be just 8x8. Just checkin'. Yeah I did know that, but thanks for checking! K, just thought it looked like you were trying pretty hard to fit it there, so I thought I'd check. The Turtles and their friend Renet, the Apprentice Timestress have gone back to the late Cretaceous to stop the banished Sorcerer Savanti Romero from destroying humanity. With the help of Mikey's new friend "Zog" the Triceratops, Savanti's T-Rex has been defeated, but he's now getting away on a Pteranodon! Its hard to tell in the picture but, the Pteranodon's wings are less than one stud over the edge of the base. There is a picture on my flickr demonstrating it. 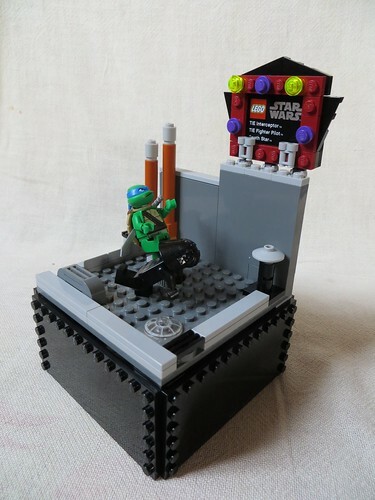 Shown below is my three tier submission for the 16x16 stud vignette contest. The dimensions on each side are 16 studs, with no overhang on each side. I have included three pictures below for the contest, as well as the link to the album on my Flickr account for extra shots. Shredder and the Kraang have teamed up, and are trying to poison the water supply by disabling the water filter stations in the sewers. 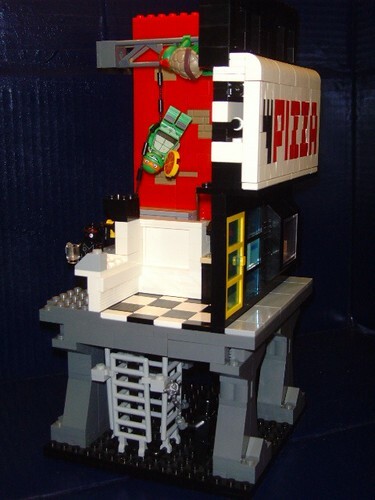 Can they stop them before Antonio's pizza shop suffers from the contamination? Thank you, it was a fun build and contest! 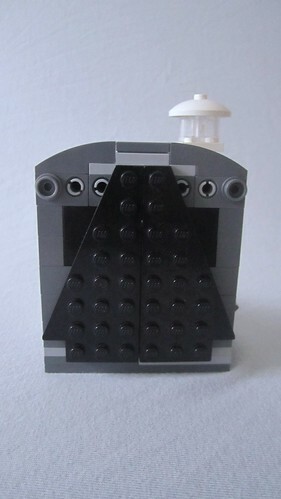 I understand that we can only have 16 studs+ 1stud overhang on a side. If we have less than 16x16 (ex12x12) we are allowed more overhang correct? What's happening is the four turtles are about to be defeated by the foot clan. My inspiration comes for the 2012 cartoons The Gauntlet when there is an ooze bomb like the one in the episode.I have a ooze container that is spilled,pizza box and,I have a ninja star like if it was thrown by a foot. Last edited by 717dif on Tue Mar 26, 2013 5:42 am, edited 2 times in total. 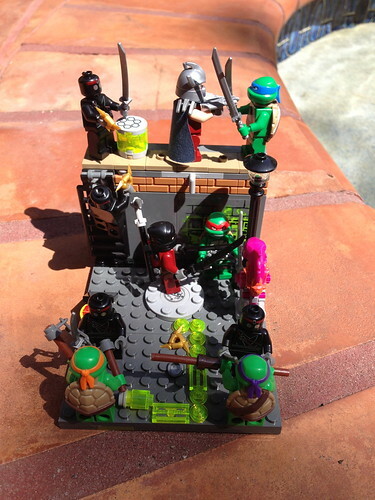 Foot Clan Turtle Trap Foiled! 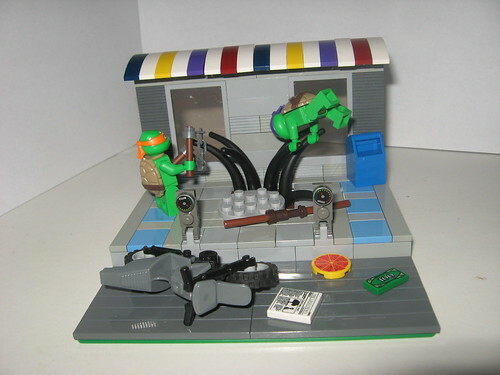 The Foot Clan is using the Turtles love of pizza as a trap to capture them and bring them to Shredder. They have opened Foot Clan Pizza and installed a trap door in front of the pick-up counter. 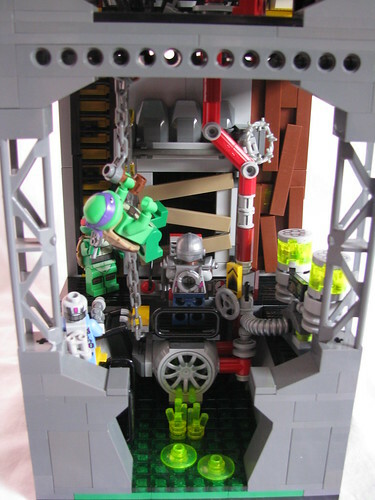 Unfortunately for the Foot Clan the Turtles didn't use the front door! 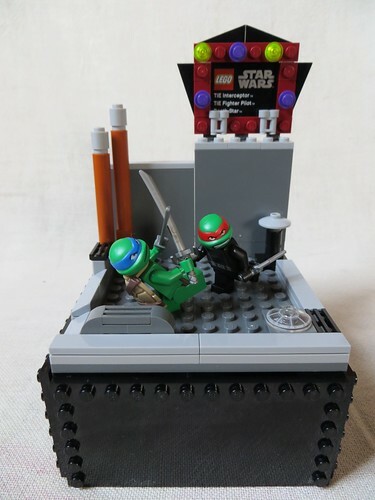 This entry is not based off any known TMNT movie scenes or TV episodes. As long as you keep it within a 16x16ish stud box you're fine. Several people have posted pics of a scene and the pics are different as if showing a scene over time. Is that what is desired? I've never made a vignette. I have some ideas that I like, but some of them I would build something to take a pic from a very specific angle to achieve the effect I was looking for. 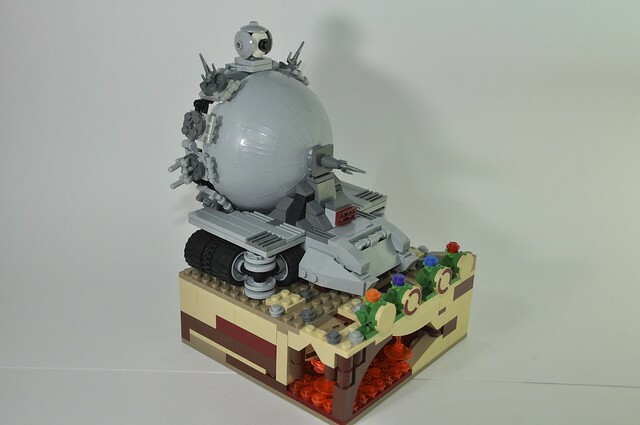 To me thats almost making the contest about photography as much as the actual build. I have a couple ideas that could stand up on there own from any angle, but the ones I think would be cooler would only look good if looked at from the right angle. Wow, some of these entries are so complex. Mine feels a little inadequate in comparison. "Size matters not." Okay Yoda, I'll enter anyway. So here's my entry. 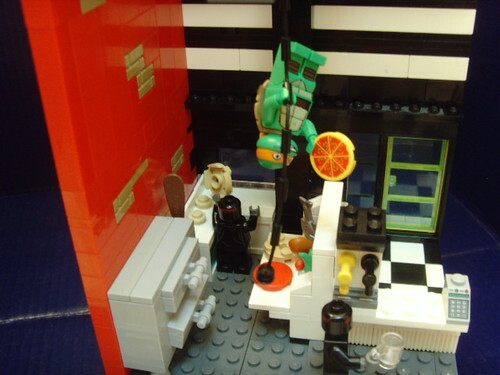 Donatello and Michelango just wanted to go pick up a pizza and a newspaper for Master Splinter. Of course, nothing ruins your trip to the surface like a mutant tentacled sewer monster waiting for you when you get back. There is no overhang, unless the motorcycle or blue box have slid a bit. I hope you enjoy. There are 10 kinds of people in the world, those who can understand binary, and those that can't. "None of you understand. I'm not locked up in here with you, you are locked up in here with me!" - Rorshach, Watchmen. Jake's Oy: When the polls go up it will have the first shot you post. That single photo is what most people will use to decide. Any other shots from other angles are just to show off some parts that may not be visible from the main shot or to prove that it meets the requirements. First, thank you for the great competition and the great entries. I really liked looking at all of them; they are very creative. I'd like to submit this for the contest, which I call "The Power of 4". There are the 4 different and unique turtles, the 4 letters "TMNT" and the 4 mysterious letters "TCRI". I built this on a 12x12 base with an overhang on the 2 sides shown (up to 2 studs total overhang). What went from a 4 story concept, quickly turned into a 7.5(?) story creation. 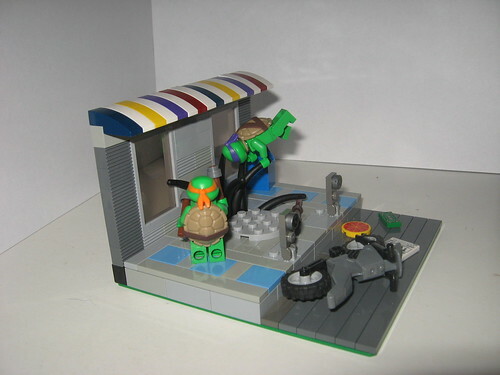 I've waited more than 20years for TMNT legos, so I got a bit excited . The 'TMNT' 'T' is made form the yellow tubes, 'M' from the orange tubes, etc. 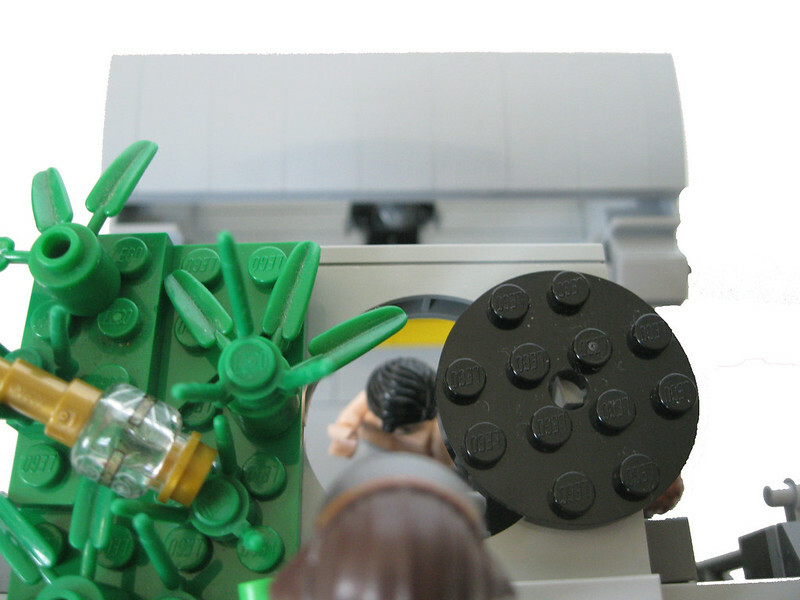 'TCRI' is written in glow-in-the-dark Legos from the side. Unfortunately, I didn't have enough time to make everything as pretty as I would like, but I was able to somehow finish. 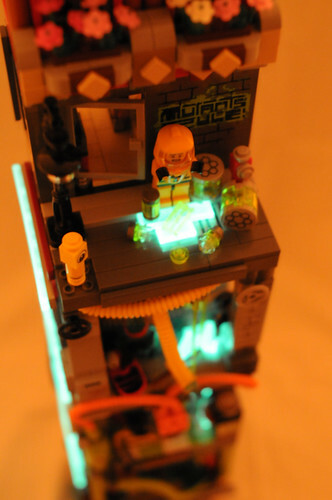 Here is the main view taken in low lighting to show the glow-in-the-dark Legos. The pictures were only resized and cropped. No color correction was done at all. This was taken in very low lighting (and was very difficult to get non-blurry!) It is my favorite picture. I know the nuclear guy is not from the TMNT world, but he's great. He was called it to clean up the spill. 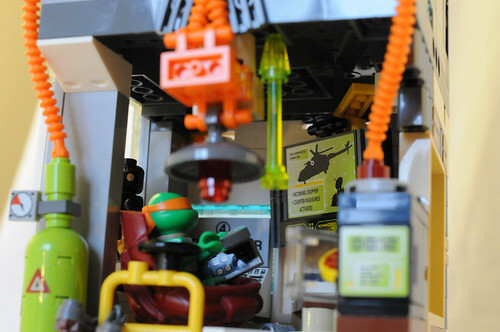 Here's a close-up of Mikey's room. He's busy playing video games and doesn't notice the foot soldier behind him. In case people are wondering; I used glow-in-the-dark 1x2 plates I got from Legoland Germany, the pirate 'poster' is from the Lego POTC DS card holder, and Mikey's chair is a bionicle head turned upside-down.